Palmdale is a city, located in California. The city is located in the heart of northern Los Angeles County. Palmdale is the first village, which is recognized as a city within the Antelope Valley. The city received official status in 1962. The population of the city of Palmdale is about 152 000 people. The first European settlement in the place where today the city of Palmdale is, was called Palmenthal. It was founded as a village in 1886. It was founded by the Lutheran travelers who were mostly of German and Swiss origin. According to local legends, travelers knew they are near the ocean when they see palms. Although they had never before been seen palm trees, they confused palm trees with the Joshua tree and called the settlement by the name of the palm. In 1888, in the village was founded the first post office. In the nineties of the nineteenth century, farm families knew that fruits and vegetables can be grown there, since they heard that there are favorable conditions for agriculture, came to live permanently in Palmenthal. Many of these settlers distressed when they were faced with the problem of growing plants in a desert climate, so most people sought their fortune elsewhere. In 1899, the village was inhabited by one family. The remaining inhabitants moved closer to the railway system of the Southern Pacific Railroad. Even the post office was moved. The new settlement was called Palmdale and it was where today the center of Palmdale is. A railway station was built, which attracted many new people wishing to become residents of the new town. In 1924 the dam Littlerock and the tank Harold were built. Today, this is called Lake Palmdale. Agriculture developed successfully in the newly created city of Palmdale. During World War II, however the economy declined. In 1957 the first university in the city Palmdale was founded. In 1962 Palmdale was officially recognized as a city, and it was connected to five square kilometers of land, which today is around downtown. In 1964 construction was completed of the Antelope Valley freeway. That was the connection between Palmdale and Los Angeles. In 1965 the city received more territory- fifty-two square kilometers of land. 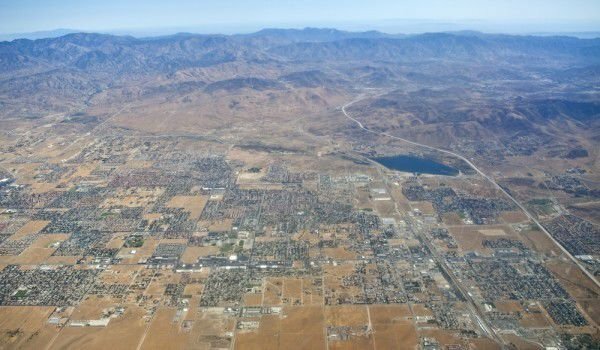 In 1970 Los Angeles purchased over seventy square miles of land east of Palmdale to build an intercontinental commercial airport there. In 1971, the Regional Airport Los Angeles-Palmdale opened its doors. In 1977 Palmdale erected the first building of the city library. The population has not stopped growing at ever faster pace. In 2000 the population of Palmdale exceeded one hundred and sixteen thousand people.